Ferragudo is known for being one of the most beautiful fishing villages in Algarve and it is surounded by a large pretty beach with all kind of amenities like children park ,play grounds, water games,jet-sky renting and restaurants. the house is knew and has a livingroom in ( L shaped) with a terrace over looking the estuary of the river arade . The two bedroom have a private bath room, it is 5 mn away on foot from the center of Ferragudo which is very lively . On the main square there are plenty of cafes and restaurants . 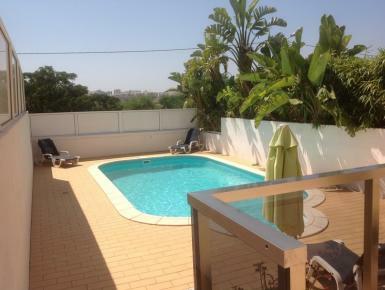 The private swiming pool is : 8 x4 mts and is equiped with 4 good transats .